Home » derby , Göztepe , Karşıyaka , rivalries , rivals , Turkey » Football Rivalries - Izmir Derby - Göztepe SK vs Karşıyaka S.K. Football Rivalries - Izmir Derby - Göztepe SK vs Karşıyaka S.K. Many football enthusiasts know about rivalries such as the derby in Rome, or perhaps the hatred between the rivals in Buenos Aires, Boca Juniors and River Plate. 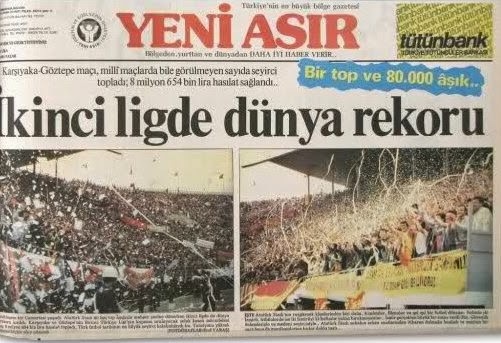 But it would take quite a bit of time to find someone who is not of Turkish background, who knows about the incredible derby played out between two Izmir clubs Göztepe SK and Karşıyaka S.K. The reason for the very low level of coverage for this particular derby outside of it country of origin is probably because the clubs almost never play in top tier football. But the fact that they rarely make it up to the highest level of the Turkish pyramid, does not make this rivalry any smaller than some of the biggest derbies in the entire world. Sure, there are three more predominant clubs in the city with Altay, Bucaspor and Altınordu based in Izmir as well. 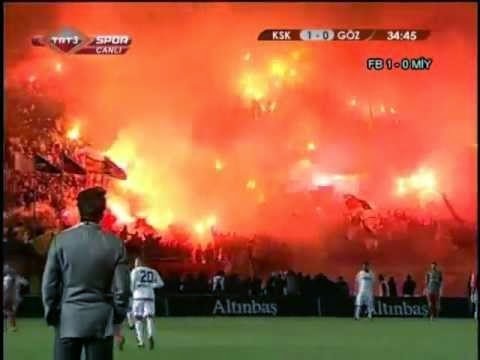 But the hatred between Göztepe and Karşıyaka surpasses those of any other Izmir derby combination. Karşıyaka is the oldest of the two having been established in 1912, with Göztepe being founded in 1925. Through the 1960's Göztepe was quite successful winning two Turkish cup titles and becoming the first Turkish side to reach the quarter-finals of a European competition when they qualified to that stage of the Cup Winner's Cup suring the 1969-70 season. Karşıyaka has enjoyed less success, only playing in Turkey's top division for 16 of their 102 years in existence thus far. But the passion burns deep when it comes to these two clubs, and on May 16, 1981 the two clubs entered the Guinness Book of Records when they played out their second tier meeting in front of a crowd of 80,000 people, for a match that was deemed the most attended non-top flight match in the history of football. Currently neither club plays in the top tier in Turkey and a meeting between the two became impossible when Karşıyaka S.K. crashed out of the Turkish Cup following a penalty shoot-out loss to another Izmir club, Altay SK.